Today in England is the feast of the Forty Holy Martyrs of England and Wales (in Wales this is a memorial), a group of forty men, women, religious, priests, and lay people who were canonized by Pope Paul VI on October 25, 1970. These people were executed for their Faith during a period of anti-Catholicism from 1535 to 1679. The Martyrs who were canonized were among more than two hundred martyrs who had been beatified by various earlier popes. According to the 1962 Missal of St. John XXIII the Extraordinary Form of the Roman Rite, today is the feast of Sts. 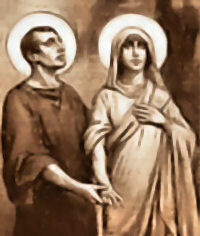 Chrysanthus and Daria, a husband and wife who carried on an active apostolate among the noble families of Rome during the third century. When they were denounced as Christians, they underwent various tortures with great constancy, and they were buried alive in a sandpit in the year 283. Today the Roman Martyrology remembers the martyrs Crispin and Crispinian, who died in the persecution of Diocletian by the sword. They were brothers, possibly twins, and cobblers. St. Crispin's day has been immortalized by Shakespeare's Henry V speech before the Battle of Agincourt in 1415. St. Nicholas Owen, Jesuit lay brother and master carpenter, who constructed many priests’ hiding-holes in houses throughout the country, some of them so cunningly concealed they were not discovered until centuries later (1606). Under James I and Charles I the purge died down, but did not entirely cease. St. John Southworth, missionary in London, was put to death under Cromwell and is venerated in Westminster Cathedral, and the final martyrs died in the aftermath of the Titus Oates plot in 1679. [SS. John Fisher & Thomas More are not included in this list for they had been canonized in 1935]. If you would like to learn more about the Forty Martyrs you can purchase a pamphlet published by the Catholic Truth Society from St. Bernard Books. For a list of the forty martyrs and a little more information about some of them, you can visit this site. According to legend these two saints belonged to the nobility. Daria received baptism through the efforts of her husband Chrysanthus. In Rome they were instrumental in bringing many to the faith, for which cause they were cruelly martyred. Chrysanthus was sewn inside an ox's hide and placed where the sun shone hottest. Taken to a house of ill-fame, Daria was protected by a lion while she passed the time in prayer. Finally both were buried alive in a sand-pit and thereby together gained the crown of martyrdom (283). They were buried in the Jordan cemetery on the Via Saleria, Rome; at the same site were buried sixty-two soldiers who died as martyrs and also a group of faithful who had gathered together for the holy Sacrifice on the anniversary of saints' deaths but were cut down by the enemies of Christ. Patron: Eissel, Germany; Salzburg, Austria. The Roman Martyrology includes these twin brother martyrs for this day. St. Crispin was a Roman noble and brother of Saint Crispinian with whom he evangelized Gaul in the middle 3rd century. They worked from Soissons, preached in the streets by day and made shoes by night. The group's charity, piety and contempt of material things impressed the locals, and many converted in the years of their ministry. They were martyred in Rome in 286 by torture and beheading, under emperor Maximian Herculeus, being tried by Rictus Varus, governor of Belgic Gaul and an enemy of Christianity. A great church was built at Soissons in the 6th century in their honor; Saint Eligius ornamented their shrine. This feast was immortalized by Shakespeare in his play Henry V, (Act 4, Scene 3). The king gave a rousing speech (called "Saint Crispin's Day) on the eve of the Battle of Agincourt, fought on this day in 1415. (Read a synopsis of the battle.) The English, although outnumbered, soundly defeated the French. In England this was a religious holiday on which commoners and serfs got a day of rest. Patron: Cobblers; glove makers; lace makers; lace workers; leather workers; saddle makers; tanners; weavers. Symbols: Cobbler's last; shoe; shoemaker's tools; awl and knife saltire; millstones; flaying knives; rack.